The Holy Apostle Thomas was born in the Galileian city of Pansada and plied the trade of fisherman. Hearing the good tidings of Jesus Christ, he left all and followed after Him. 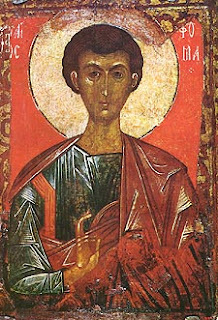 The Apostle Thomas is included in the number of the holy Twelve Apostles, the 12 closest disciples of the Saviour. By the account of Holy Scripture, the holy Apostle Thomas did not believe the reports of the other disciples about the Resurrection of Jesus Christ: "Unless I see in His hand the wound of the nail, and place my finger into the wound of the nail, and place my hand in His side, I shalt not believe" (Jn. 20: 25). On the eighth day after the Resurrection the Lord appeared to the Apostle Thomas and shew His wounds. "My Lord and my God" -- cried out the holy apostle (Jn. 20: 28). "Thomas, being once weaker in faith than the other apostles, -- says Saint John Chrysostom, -- toiled through the grace of God more bravely, more zealously and tirelessly than them all, such that he went preaching almost over nearly all the earth, not fearing to announce the Word of God to savage nations". According to Church Tradition, the holy apostle Thomas founded Christian churches in Palestine, Mesopotamia, Parthia, Ethiopia and India. Preaching the Gospel earned the apostle a martyr's death. For having converted the wife and son of the governor of the Indian city of Meliapur (Melipur), the holy apostle was locked up in prison, suffered torture, and finally, having been pierced with five spears, he expired to the Lord. Part of the relics of the holy Apostle Thomas are in India, in Hungary and on Athos. With the name of the Apostle Thomas is connected the Arabian (or Arapet) Icon of the Mother of God (Comm. 6 September).